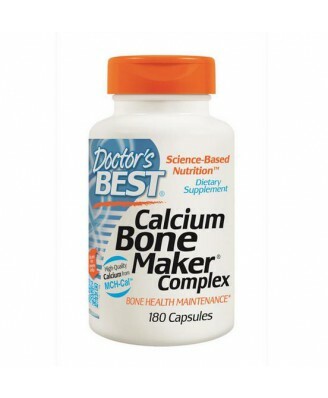 Calcium Bone Maker Complex represents the most advanced clinical understanding of bone health. Bevat niets anders dan de genoemde ingrediënten. Bone is living tissue, and this formula supplies key bone nutrients in their most bioactive forms. Ossein microcrystalline hydroxyapatite complex supplies organic calcium with natural bone growth factors. Vitamin C assists bone matrix formation. 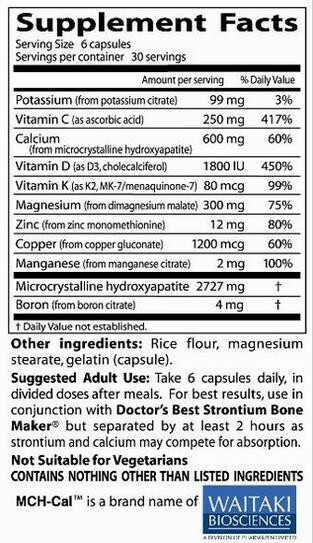 Vitamin D and K are crucial to matrix calcification, along with magnesium, potassium, zinc, copper, manganese, and boron. 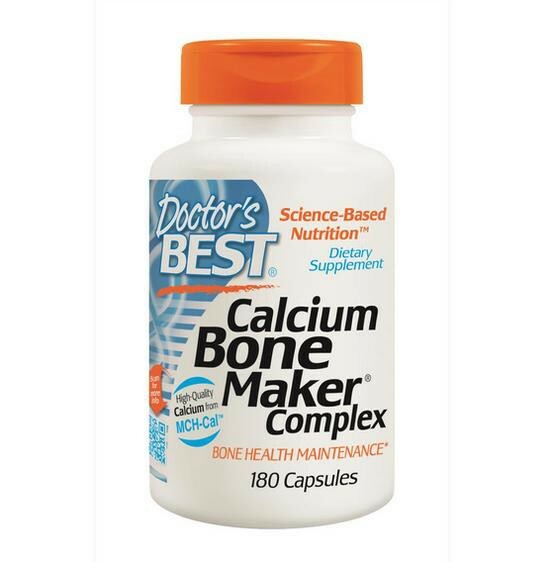 Calcium Bone Maker Complex represents the most advanced clinical understanding of bone health. Broad nutrient spectrum for healthy bone replacement. Optimized to ensure safe and effective calcium utilization. No magnesium oxide or other poorly absorbed ingredients. Promotes skeletal, muscular, overall health and well-being. Calcio - Calcio ayuda a reducir la pérdida de mineral ósea en mujeres posmenopáusicas. Baja densidad mineral ósea es un factor de riesgo para la fractura osteoporótica. El calcio es necesario para el crecimiento y desarrollo normal de los huesos en los niños - calcio. Take 6 capsules daily, in divided doses after meals. For best results, use in conjunction with Doctor's Best Strontium Bone Maker but separated by at least 2 hours as strontium and calcium may compete for absorption.